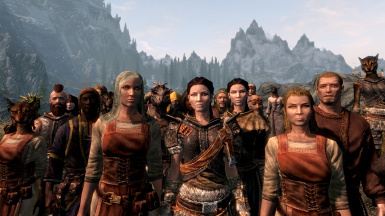 Travellers of Skyrim adds 50 new NPCs that travel between over 30 locations in Skyrim. Including Alchemists, Apothecaries, Mercenaries and Merchants. Main File: tweaks to merchants' inventories, reference errors solved. Light Version: tweaks to merchants' inventories. Initial release of both files. Fixed a critical AI Package bug affecting most traveller types. Version number has been corrected, 1.20 -> 1.11. 10 Alchemist, selling poisons, potions and ingredients. 10 Apothecaries, selling cure / healing potions and a small amount of ingredients. Additionally they offer to cure the player for 50 gold. 10 Merchants, buying and selling various useful goods. 20 Mercenaries, offering their service for 500 gold like the existing hirelings. 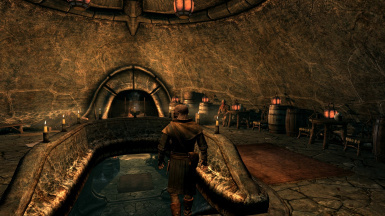 The NPCs randomly choose to travel to one of the 18 inns in the world and profession specific locations (e.g. merchants visit general goods stores). Depending on where they arrive the travellers will eat, chat or sit around before continuing their journey. They are killable and re-spawn. 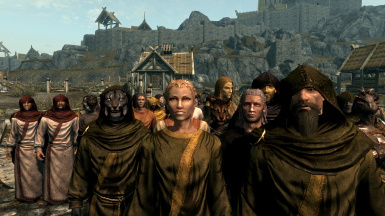 The Alchemist are split up into: female and male Bosmer, Breton, Dunmer, Khajiit and Nord. They wear hooded robes and sell: cure potions, restoration potions (health, stamina, mana), poisons and ingredients. Beside inns they visit apothecaries. 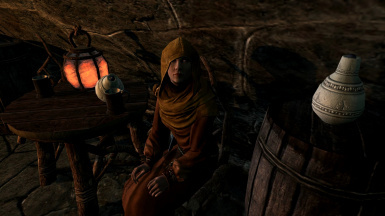 The Apothecaries are split up into: female and male Altmer, Argonian, Breton, Imperial and Nord. They wear plain robes and sell: cure potions, restoration potions (health, stamina, mana) and a small amount of ingredients. Additionally they cure the player for 50 gold via a dialogue option. 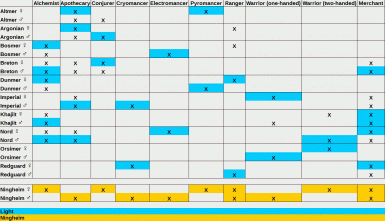 The mercenaries are split into conjurers, mages (Cryo-, Electro- and Pyromancers), rangers and warriors (one- and two-handed). They work like the existing hirelings and cost 500 gold. All the mercenaries visit castles and courts, inns and general goods stores. Ranger and warriors visit blacksmiths in addition to that. Female Breton, male Altmer, Argonian and Breton. They wear conjuration enhancing clothing and have access to healing, ward, (limited) destruction and summon spells. Female Redguard, male Imperial. They have access to healing and ice destruction spells. Female Nord, male Bosmer. They have access to healing and storm destruction spells. Female Altmer, male Dunmer. They have access to healing and fire destruction spells. Female Argonian, Bosmer and Dunmer, male Redguard. They wear light armour (no helmet) and wield a sword and bow. Female Imperial, male Khajiit and Orc. They wield a random one-handed weapon and shield. Female Khajiit and Orc, male Nord. They wield a random two-handed weapon. 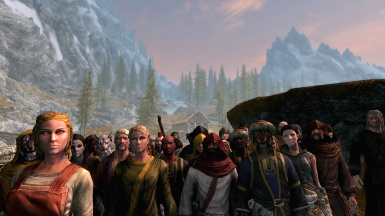 The Merchants are split up into: female and male Breton, Imperial, Khajiit, Nord and Redguard. weapons, armours, enchanted robes, jewelery, gems, ingots, ores, food, drinks, ingredients, recipes, books, soul gems, spell tomes and hides. Beside inns they visit general goods stores. 1. Extract the .rar file to 'Steam\SteamApps\common\Skyrim Special Edition\Data'. Or simply use a mod manger of your choice. Regardless of the installation method dismiss any active mercenaries before uninstalling the mod! 1. Start the Skyrim Special Edition, click 'Mods', go to 'Load Order', remove the check mark beside the 'TravellersOfSkyrim.esm' file and besides the .esp file (e.g. 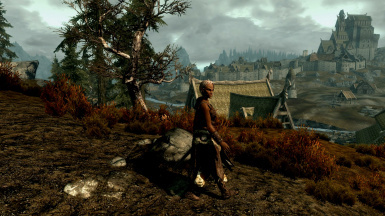 TravellersOfSkyrim - Vanilla.esp, TravellersOfSkyrim - Dragonborn Addon.esp) you chose to download. 2. Delete the 'TravellersOfSkyrim.esm' and any Travellers of Skyrim .esp files file from 'Steam\SteamApps\common\Skyrim Special Edition\Data'. 3. Delete any files with 'm0tos_' in front of their name from the 'Scripts' folder inside of 'Data'. 4. 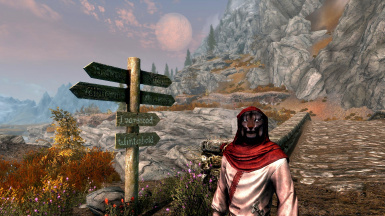 Delete the folder named after the Travellers of Skyrim .esp you chose to download inside of 'Data\Meshes\Actors\Character\FaceGenData\FaceGeom' and 'Data\Textures\Actors\Character\FaceGenData\FaceTint'. 5. Delete the TravellersOfSkyrim.seq inside of '\Data\SEQ'. 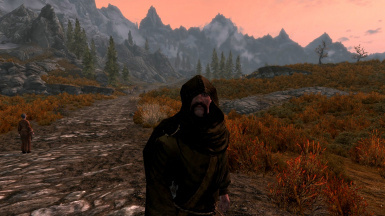 Travellers of Skyrim is not compatible with mods that remove any of the travel locations (all inns, courts and castles, general goods stores, apothecaries and blacksmiths). 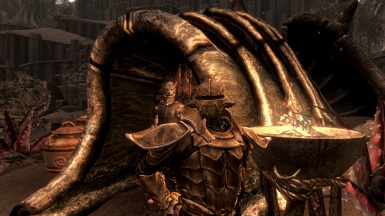 The 'Dragonborn Addon' allows the travellers to visit locations on Solstheim and use and sell the DLC's new items. Install it via a mod manger of your choice or follow the manual install instructions above. If you want to use both the 'Dragonborn Addon' and 'Bags and Pouches Addon' use the 'Dragonborn and Bags and Pouches Addon' instead! 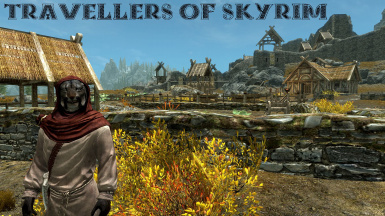 The 'Bags and Pouches Addon' adds a large selection of the items included in the 'Bandolier - Bags and Pouches Classic' mod to the travellers' outfits. Each traveller type has it's own set of equipment items, making them easily distinguishable. Set it to load after 'TravellersOfSkyrim.esm' and 'Dr_Bandolier.esp'. If you want to use both the 'Dragonborn Addon' and the 'Bags and Pouches Addon' use only this file instead. Requirements and load order remain the same. 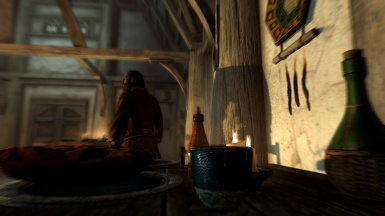 Alchemists: female Bosmer and Dunmer - male Breton, Khajiit, Nord. 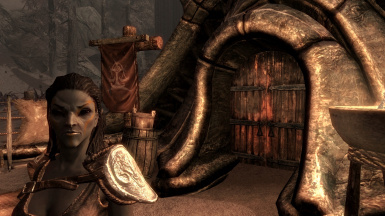 Apothecaries: female Altmer and Argonian - male Imperial and Nord. Conjurers: female Breton - male Argonian. Cryomancers: female Redguard - male Imperial. 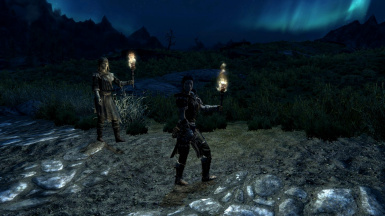 Electromancers: female Nord - male Bosmer. Pyromancers: female Altmer - male Dunmar. Rangers: female Dunmer - male Redguard. One-handed Warriors: female Imperial - male Orc. Two-handed Warriors: female Orc - male Nord. 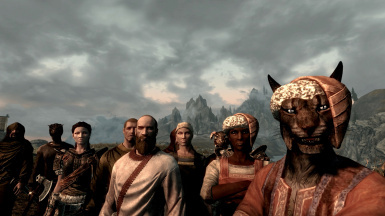 Merchants: female Khajiit, Nord, Redguard - male Breton and Khajiit. Don't use the 'Vanilla Version' ('Full Version') and 'Light Version' at the same time! to several community members, for their testing, suggestions and overall support. to the 2ch.net Japanese localization project team, dopalacz, alphazell1, Baskiney, Astra2000, ElderScrollsTurk, superben134, anoth3r, queltizio, craftymonkey and cobija for their translations. to noobzor for creating and sharing the 'CCOR Addons'. to Arwen for her 'How to Do a Clean Save'. to 'The Ningheim Race' team for their mod and permission to create 'The Ningheim Addon'. to Dragten for his mod and permission to create the 'Bags and Pouches Addon'. to kryptopyr for her mod and permission to create the 'CCOR Addons'. to Leviathan1753 & DienesToo for the SkyProc library. to Bethesda for their great games. You can find me on the Nexus Sites, the official Elder Scrolls forums and TES Alliance as 'm0nster'.